Pioneers in the industry, we offer chemical process pumps, bilge pump, bitumen pump, ceramic slip pumps, emulsion matrix cavity pumps and flocculant pumps from India. 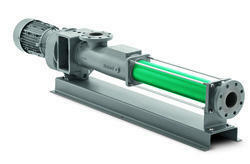 We are offering wide range of Chemical Process Pumps. As we are Constantly endeavoring to improve the performance of our products/equipments, We therefore reserve to modify pumps shown in this brochure without notice. The chemical industry impacts our lives daily. Without it, countless products so familiar to us could not exist like car components, computers, cleaning supplies, and dental prosthetics. The chemical industry includes diverse applications that result in the need to convey an extensive variety of products, including such substances as softeners, adhesives, urea, dispersions, hydrogen peroxides, kaolin, PVC, PVA, resins, and titanium dioxide. 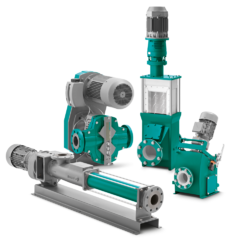 With over 150,000 NETZSCH pumps in the field over the last five decades for the chemical industry alone, NETZSCH offers the experience you need to match your requirements. 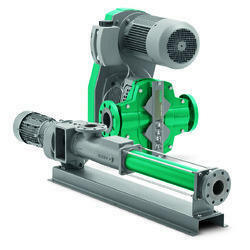 Pumps made of conventional materials such as stainless steel and cast iron are not always appropriate, especially in the chemical industry so NETZSCH offers NEMO PUMPS® in materials such as duplex stainless steel, Hastelloy®, Uranus® or titanium. Your NETZSCH team of experts will help you find the perfect solution for your specific application. We are the Leading manufactures of Industrial Bilge pump. We are the leading manufacturer and supplier of an excellent quality range of Bitumen Pumps. These are applied in various industries, the Progressive Cavity Pump has been used as fluid transfer pump for years. These Progressive Cavity Pumps have the ability of pumping or transferring high and low viscosity products, with or without solids or long fibers, in suspension. We are the leading manufacturer and supplier of an excellent quality range of Ceramic Slip Pumps. These are applied in various industries, the Progressive Cavity Pump has been used as fluid transfer pump for years. These Progressive Cavity Pumps have the ability of pumping or transferring high and low viscosity products, with or without solids or long fibers, in suspension. We are the leading manufacturer and supplier of an excellent quality range of High Consistancy MC Paper Pulp Pumps. These are applied in various industries, the Progressive Cavity Pump has been used as fluid transfer pump for years. These Progressive Cavity Pumps have the ability of pumping or transferring high and low viscosity products, with or without solids or long fibers, in suspension. We are the leading manufacturer and supplier of an excellent quality range of Industrial Shampoo Pumps. These are applied in various industries, the Progressive Cavity Pump has been used as fluid transfer pump for years. These Progressive Cavity Pumps have the ability of pumping or transferring high and low viscosity products, with or without solids or long fibers, in suspension. We are the leading manufacturer and supplier of an excellent quality range of Mine Dewatering Pumps. These are applied in various industries, the Progressive Cavity Pump has been used as fluid transfer pump for years. These Progressive Cavity Pumps have the ability of pumping or transferring high and low viscosity products, with or without solids or long fibers, in suspension. We are one of the most renowned names of the market engaged in offering Drilling Mud Pump in the market. These pumps are widely appreciated for their superior performance at the clients' end, even in muddy conditions. Moreover, we can customize these pumps to met the specific industrial requirements.